An amazing development environment to connect to microservices for the right financial journey to target customers. Build your customer experiences with widgets that are easy to build and maintain connected to your core business systems. 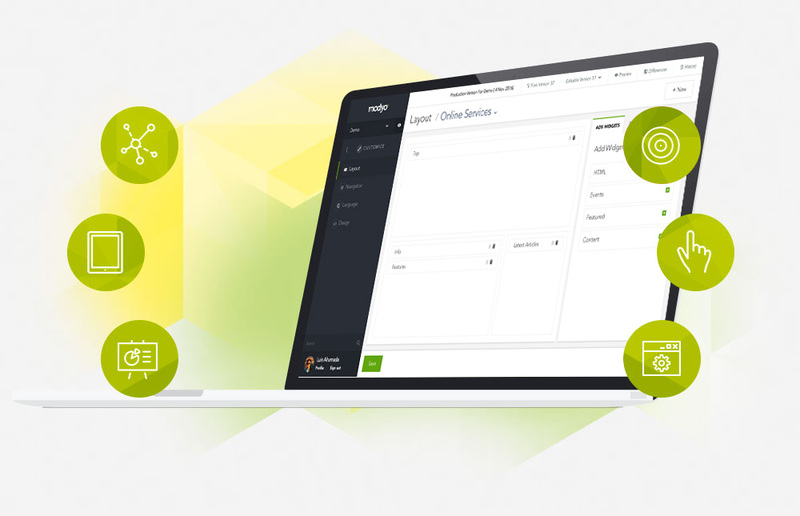 Manage web and mobile in one place. Create widget libraries that are easy to maintain and improve. Drag and drop widgets for the right experience to the right client. Be agile out of the box with our development environment. Target your financial customer journeys to the right people. Easily create web and mobile journeys that target the right financial products, content and promotions to customer segments. Manage both the public and private site in one integrated platform with your digital factory aligned to produce relevant customer experiences to the right customers at the right time. Start with either the public or private client sites and build using agile practices to cut your development time in half. Build different financial journeys faster and give your institution a long term competitive edge with Modyo. Establish the right balance building and personalizing experiences with a lightweight platform. Build for web and mobile in one place to develop faster, maintain easier, and drive customer journeys across web + mobile. Target just about anything to the right customers at the right time. The best front end development platform for financial insitutions to protect their reputation and speed up digital transformation. Integrate Modyo into what you already have. Build your customer journey without replacing everything. Integrate, add funcionality or replace depending on your unique situation. Know your customer to offer the best products and services. The Modyo data machine puts your customer data at the center of the digital experience for smarter relationships. Build your corporate, consumer or investment sites based on one core multi-site platform that scales to millions of customer journeys in our cloud or yours.